American Laser Games was the team who brought us FMV Shooters like Mad Dog McCree, Mad Dog 2: The Lost Gold, Crime Patrol, Crime Patrol 2 (Drug Wars), The Last Bounty Hunters, Fast Draw, Space Pirates and Who Shot Johnny Rock? - Both Fast Draw Space Pirates never made it on CD-i, but the others are released by CapDisc. Thunder in Paradise is another FMV shooter, although Thunder features computer animated enemies instead of FMV characters. So it's not 100% Full Motion Video. In my opinion Thunder is the best because of this, as the enemnies now aren't pre-fixed on the same places everytime, but they appear random! One of the things asked about CD-i is if the CD-i gun will work on new LCD screens or projecters. Yes, The gun will work with both a projector or and LCD/Plasma screen. 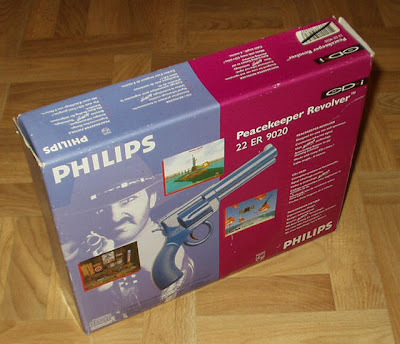 It's true that other console guns work different and won't work on these types, but the Peacekeeper gun is actually a pretty innovative piece of hardware as it works the same way as the Wii remote.